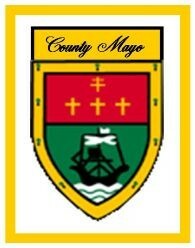 The crest was originally used by the county GAA and was later formally adopted as the County Council official Mayo crest. The word Maigh Eo means Mayo in English. The crest consists of nine yew trees around the edges representing "the plain of the yews"; there is one yew for each barony in the county with four crosses, a ship and waves in the centre. The Patriarchal Cross (a cross with two bars) symbolises the Catholic Archdiocese of Tuam and the three smaller crosses represent the other three Catholic dioceses in Mayo, i.e. Achonry, Killala, and Kilmacduagh-Kilfenora (Galway). The motto "Dia is Muire Linn" translates as "God and Mary be with us". This page was added by Averil Staunton on 15/11/2010.